A water purifier is an essential appliance for every household. It can protect your family from the chemical contaminated and germ added water and thus eliminate the possibility of the water-borne diseases. Nowadays, a range of water purifiers of different brands is available in the market but you have to choose the best one to ensure your family’s health with fresh and clean water. RO + UV + UF with TDS Controller: Kent Grand Plus is providing double purification of RO + UV + UF with TDS controller to maintain the crucial natural minerals. 8 Litres Storage Capacity: Kent Grand Plus is associated with 8 litres of water storing capability for which one can drink water as per their convenient time. NSF, CE, ISI and WQA Gold Seal Certified: This model is NSF and WQA certified that is providing the assurance of its rigorous testing along with fulfillment of every requirement of the essential testing standards. Purify the Inlet Water Collected from Every Source: This water purifier can purify inlet water that has come from various sources including tanks, tap-water or bore-wells. ABS Food Grade Plastic Construction: This incredible model has been designed by using ABS food grade plastic that makes sure longer life and higher durability of this purifier. High Power 11 Watt UV Lamp: This particular water purifier is installed with the high power 11 watt UV lamp and thus deactivates each and every micro-organism from the water. Filter Change Alarm along with UV Fail Alarm: This water purifier is featured with two unique properties – filter change alarm and UV fail alarm for notifying the people about the filter change. Built in SMPS: This amazing water purifier is associated with built-in SMPS or Switching Mode Power Supply for handling a large range of input AC voltage of 100 – 300 Volts. Spin Welded RO Membrane: Its RO membrane housing is spin-welded with advanced technology that blocks the membrane from tampering. Completely Automatic Operation: This model is completely automatic in its operation and t implies that this water purifier can operate freely without the requirement of manual involvement. Push-Fit Components: Kent Grand Plus is involved with such components and fittings that are push (snap) fit for preventing the leakages along with wastage of the water. 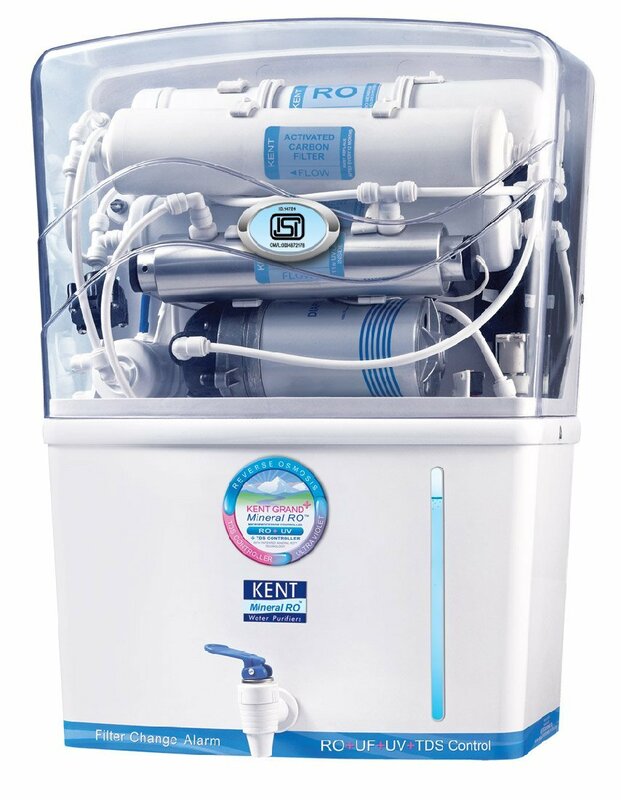 Kent mineral RO water purifier amazingly purifies the collected raw inlet water in an excellent way and makes this water 100% pure for your drinking. The filtration components of this water purifier are Sediment Filter, Activated Carbon Filter, RO Filtration, Ultrafiltration, TDS Controller, Ultraviolet Filtration, and Post Carbon Filter. So, now, it has become easier for you to select the best water purifier for you along with your family. Which is Best Brand for Water Heater/Geyser in india?